Jayden Leishman reading his book in preparation for his book project. Many varying classes and levels are participating in a semester-long book project. While every class has a slightly different project, according to English teacher, Tabitha Lopez, her goal for all of them is the same. “Independent book projects force you to think critically about a book and show interest in other novels,” Lopez said. Lopez made a list of novels that her students can pick from which allows them to be more independent and passionate about their project. Yet, some students are still unhappy despite the choice involved with the book projects. Freshman Louie Cordova expressed his lack of excitement. “With all the new projects, I think it’ll be hard to be doing a big project and then multiple little projects… What’s the point?” Cordova said. Berlyn Whitlock, a freshman, is another student who thought there was too much work involved with the projects and sees little reason for the overload. 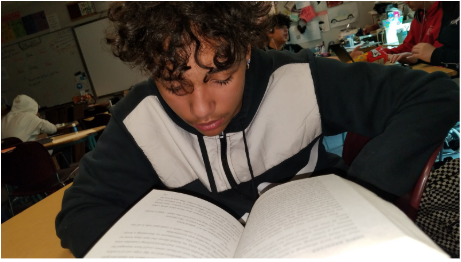 “I like English a lot but we have so many projects and I think it distracts us and doesn’t really allow us to dive deep into the book and explore it more,” Whitlock said. Teachers are encouraged to give students more projects because the school is switching to Project Based Learning. These projects will help students to develop a better understanding for reading, especially for students that didn’t enjoy reading at the beginning of the year. Lopez is dedicated to encouraging her students and to help them find their love for reading.